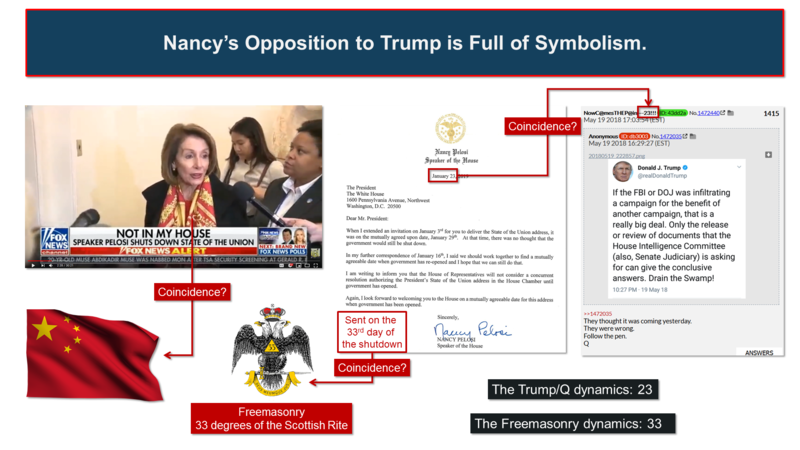 Using #Qanon #Post #SerialBrain2 #Decodes #Trump’s Secret Message to #Nancy. Okay my friends, with the training you have now received, you already know Covington was a smoke screen designed by the Deep State to distract us right? In my January 19th 2019 morning post, I told you about the assassination attempt on POTUS, its connection to JC, sleeper cells in the US, ANTIFA, Taheb and the related shenanigans with Nancy and her puppet Chucky. hemeof the day the number 4 Using #Qanon #Post #SerialBrain2 #Decodes #Trump’s Secret Message to #Nancy. Coincidence? You know what’s going on right? Double Peruvian coffee for those who noticed the theme of the day for the Maestro’s tweets was the number 4! And a very special mention for those who solved this one using the SECRET OF NINE and what ONE NINE represents. Difficulty level? High. As confirmed by the Maestro in the tweet: ‘Not easy!’ Happy hunting! The Maestro also told us who executed this communication operation for her. Look at the tweet capital letters. Making sure you group them as hinted by the dash between ‘false’ and ‘smeared’, you get: NNNATC=66=PLANNED and LNSCC=51=ANTIFA. This Covington incident was planned by the Dems and executed by ANTIFA, in the disguise of the so called Black Hebrew Israelites who were present only to create problems. You remove them from the picture, Covington would have never happened, as well explained hereYouTube. Don’t be fooled. The Fake News Mockingbird media knew the truth about Covington all along. Their apologies are fake. Their initial coverage was a mass decoy. That’s the appetizer. Let’s now go through all the Maestro’s tweets posted on Jan 20 2019. Let’s connect the timestamps to their corresponding Q drops. For example the timestamp 7:40AM will be connected to Q740, 1:16PM to Q1316 and so on. This will provide the additional context required to decode the tweets using their respective capital letters. You get the following individually decoded messages. Read very carefully and try to follow how they were gathered. Notice subtleties like the way DEFENCE is spelled in the Five Eyes or how LIGHT SWITCH is connected to Q2672. “Nancy, our economy is doing very well because I have put an end to the treasonous policies that were depriving the American People from its wealth and exporting it to China in priority. I have restored our Military might and have also built a big fat wall around their comms and mine. Being taken advantage of economically and militarily is over. Spying on America using the FVEY loopholes and tech companies is over. I have decimated the Deep State’s positions in the private sector and in the Government. There have been many resignations and many politicians are not seeking reelection. As promised, I am draining the swamp. I am focused and know the real target. Very soon, the real numbers will speak and China will come to the negotiation table. I saw the colors of your scarf on January 23 2019, the 33rd day of the shutdown. The American People is now trained to understand symbolism and deduce your undisclosed allegiances. That’s your choice, but be careful: this is now out of the realm of politics. This is about conspiring with foreign forces to undermine the President’s agenda and security. This is about activating sleeper cells or organizations like ANTIFA or MS13 to jeopardize the security of millions of Americans. This is TREASON. My job is to keep America safe and TREASON will neither be tolerated nor unpunished. I have expanded GITMO and am currently building new prisons. Do you remember Kavanaugh’s hearing? Military Tribunals are doing their job. Should you chose to persist in undermining our National Security, you may end up the way No Name did. It is now clear the wall’s ultimate purpose is to protect America from a planned invasion and is therefore more a matter of national security than about immigration. The American People is starting to see why you are not willing to negotiate. I am aware you are actually the minority in your party and that my recent proposal about border security caught the interest of many Democrats. Perhaps they will soon see through and chose America over the shady and uncertain path you are engaged in. In the meantime, know Q is everywhere. We have it all. All the tweets, the fake names, the burner phones, the emails, the servers, everything, we have it all. We know who did what, how and when. Q2672 GJ testimony underway in several states. Attempts to BLOCK/PROTECT themselves will FAIL. Far beyond political corruption/sedition. So? Trying to eliminate me and hoping to take over? And when it failed, manufacturing Covington to distract people? Don’t you get it? I know the entirety of your playbook and, with God supporting the Patriots who are standing up and praying to save America, you will fail at everything you try. I have been preparing for this for decades. This is the very reason I am walking on earth. I am the Commander in Chief of the most skilled and powerful Military Forces in the world. One signature with a random pen on my desk and your plane was grounded. Get Q post on your Alexa enabled devide FREE!!! Author enki74Posted on February 1, 2019 February 1, 2019 Categories News of the DayTags Decodes, MAGA, message., Nancy, post, qanon, secret, SerialBrain2, treason, trumpLeave a comment on Using #Qanon #Post #SerialBrain2 #Decodes #Trump’s Secret Message to #Nancy. ( #SB2 decode of #Qanon ) #Trump’s #secret #message #about 9/11. There was a cover-up. Enjoy this video with the latest communications coming from Qanon as Decoded by SerialBrain2. #Trump's #secret #message about 9/11. #Trump’s #secret #message about 9/11. Author enki74Posted on September 19, 2018 September 18, 2018 Categories 8chan, News of the Day, POTUS, President Trump, Q-Anon, QProofsTags 8chan, 9-11, A, about, cover-up., Decode, hoax, message., qanon, SB2, secret, There, trump, war, was3 Comments on ( #SB2 decode of #Qanon ) #Trump’s #secret #message #about 9/11. There was a cover-up. Why did Trump tweet Treason??? Want to know exactly whats happening??? Watch theses 3 videos & you will be amazed!!! Are #POTUS  #Tweets & #QANON #Post #decoded here?